Mumbai: In a first-ever industry initiative, leading pharmaceutical packaging company SCHOTT KAISHA successfully concluded its 5-city roadshow, bringing together industry experts, R&D specialists, business and sales leaders for discussions on the latest technological advancements and best practices that lead to drug safety. 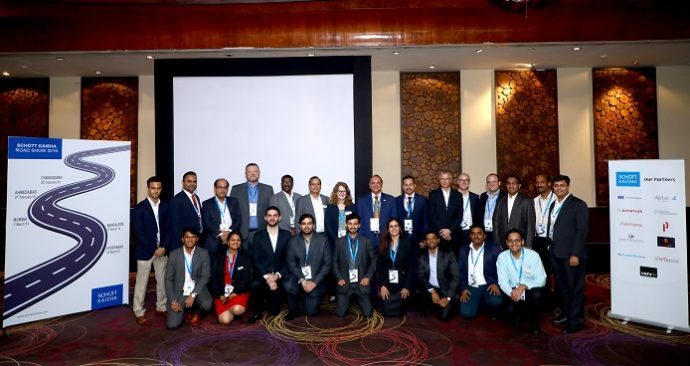 Held over 2 weeks, the events gave participants a clear understanding on the importance of conversion process in tubular glass manufacturing, and showcased SCHOTT KAISHA’s upcoming product portfolio, tailor-made design and development capabilities. With fresh investments in new sites in Gujarat and North India, expansion and upgradation of existing plants in Daman and Jambusar, SCHOTT KAISHA’s financial commitment will further increase by up to INR 500 crores between 2018 and 2020. The increased capacity will cater to the growing demand of ampoules, vials, syringes, cartridges and sterile portfolio. Through this increased production capacity, the company is focussing on catering to the domestic market first, with a current supply to export ratio of 75:25. Other partners included global industry leaders such as ACE Technologies, Aptar Pharma, Datwyler, Kaisha Lifesciences, Nemera, Packwell Industries, Shakai Packaging Pvt. Ltd., Smart Skin Technologies, Snowbell Machines Pvt. Ltd., Sovereign Pharma Pvt. Ltd. and Vanrx Pharmasystems Inc.
Today, India is undoubtedly a huge pharmaceutical market for the world, exerting unmatched strength in manufacturing of generic drugs for US and other global markets. With the Indian pharmaceutical packaging market estimated at INR 147.8 billion in 2017 and expected to reach INR 245.5 billion by the end of 2023, there is huge demand for an increased supply of high quality primary packaging material.